City Transportation Planner Tom Millar gets feedback on the Pop-Up Intersection at 9th South and 11th East. It was rush hour on a Thursday afternoon in late May, and people were stressed. Standing among a forest of traffic cones at a complicated intersection in Salt Lake City’s 9th & 9th neighborhood, Tom Millar took the brunt of it. But Millar, clad in a bright orange safety vest, didn’t take the road rage personally. In fact, it’s why he was there. “The roundabout was better,” a young woman wearing sunglasses shouted through an open passenger window as the silver sedan she rode in drove through one of five stop signs that control the intersection. "I hear that all day," Millar, a city transportation planner, said as traffic whizzed by at 9th South and 11th East. "At least once an hour: 'Where'd my roundabout go?'" 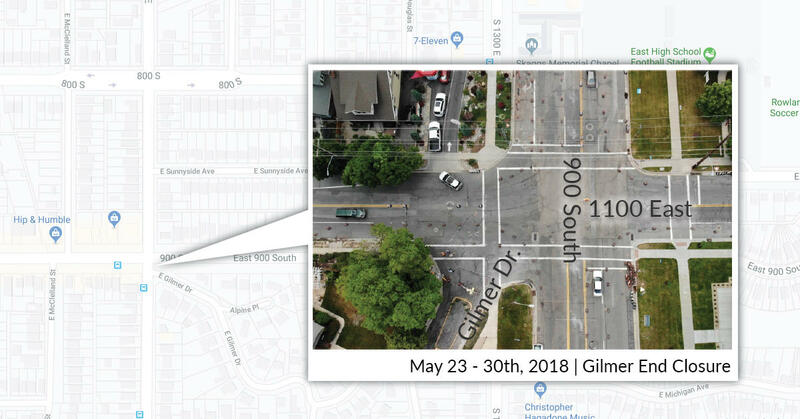 For two weeks, drivers and pedestrians were part of an urban design experiment conducted by city planners at the intersection of 9th South and 11th East. It was meant to give the public more say in the planning process. As one car after another passed through the intersection, the unwitting lab rats ran through the test. Some shared their preferences. The idea was to find the smoothest way to navigate this traffic maze. But even trying to describe it can be baffling. "Currently there are two lanes in each direction on one of the streets," Millar said of the intersection. "There's one in each direction on the other street. And there's a kind of an odd man out fifth leg that comes in at an angle on the southeast corner that causes our stop signs to be farther back than we would have them be normally in a four-way intersection." Nevermind the drive-thru coffee shack across the street that gets so busy the line of cars regularly backs into the road. With major construction planned next year for a stretch of 9th South, city planners figured this was the time to do something with this odd intersection. Whatever they put in place will likely be there for decades. Planners drew up their ideal solution and unveiled it at public meetings earlier this year. The plan basically created a second intersection. People in the neighborhood hated it. They suggested a roundabout instead. Or closing one leg of the intersection onto Gilmer Drive. In the end, planners tried both. The result: a pop-up intersection. It's like a pop-up restaurant, but for traffic: two items on the menu, planners’ choice. City officials had never tried anything like it, but they figured they’d give it a shot. John Larsen, Salt Lake City's transportation director, hopes the pop-up gains the city some credibility with the public. "I think we get accused a lot in this industry of just kind of making up our minds," he said. "And maybe there is some validity to that, but this provides an opportunity to frankly show a little bit of humility, like maybe we don't know exactly, and let's try it." During the Pop-Up, city planners worked with emergency responders, including the fire department, to test traffic patterns. Using dozens of traffic cones and reams of yellow caution tape, they built a roundabout, left it in place for a week, and watched how people used it. Then they took the roundabout down and blocked off Gilmer Drive, which created a normal four-way intersection. It was a kind of social experiment, and Millar spent more than 40 hours of his own time watching it play out. He and his fellow planning wonks agreed: it was a lot of fun. It also yielded loads of public feedback. "The benefit of a pop-up is that people can react to something that's real instead of a drawing on a piece of paper," Millar said. Residents of the Gilmer Park Historic District share their opinions of the pop-up with City Transportation Planner Tom Millar. That's the central idea of a pop-up, and a growing planning approach called "tactical urbanism." It’s about trying things on the cheap — in real time — and seeing what happens before any costly decisions are made. When New York City turned Times Square into a pedestrian plaza, officials used tactical urbanism first to test it. Usually, traffic planning is a top-down process. But tactical urbanism upends that by bringing city planners and the public together to solve problems. As local residents like Dan Bennett offered their opinions of the Salt Lake’s pop-up experiment, Millar, Larsen and their team of planning wonks were actually listening. Bennett grew up on Michigan Avenue, a block south of the intersection. Now in his 60s, he's still there. He's grown used to the five-way, and doesn't think it needs improving. In all his years, he's never seen any serious accidents there. "I don't remember ever seeing people dead in the road or anything. So I think it's a fairly safe intersection. It's just confusing because it’s a five-way," Bennett said. According to the city, there have been 15 accidents in the past eight years at 9th and 11th, but only two resulted in major injury. Planners agree: The intersection isn’t really a safety concern — it's just confusing. For some people, the traffic experiment actually made things worse. David Spattlefore, who lives on Gilmer, appreciated the city’s experiment, but he bristled at the idea of turning his street into a dead-end. A drone’s-eye view of the closure of Gilmer Drive during the pop-up experiment. "I can live with the roundabout, but I hate the closure,” he said. “It makes no sense to me." As the traffic mellowed and local residents went home, Millar watched the traffic as rush hour wound down, and called the experiment a success, no matter what’s decided. "It engaged the community,” he said. “They got to try out some things that would have cost however many hundreds of thousands of dollars to try out and it's nice to be able to let it kind of suss itself out." The pop-up was dismantled on May 30, and city officials don’t have plans to try another one anytime soon, but they’re leaving the door open. For now, planners are analyzing data from the online survey and organizing feedback. 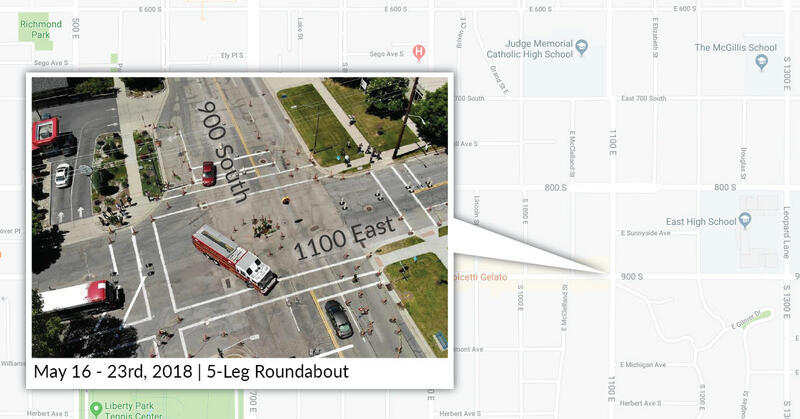 There will be more chances for public comment in the months before whatever happens at the intersection is put in concrete — whether it's a roundabout, a closure, something else entirely, or even the same-old confusing five-way.